An impressive array of speakers gathered at the Festival of Interdependence in London on Saturday, the final event in The Bigger Picture series of activities organised by the New Economics Foundation (nef). Artists, thinkers, activists and the public joined with one another ‘for a day of learning, making, celebrating and debating, about how we can start the Great Transition to a new economy’. Speakers included Green MEP, Caroline Lucas, John Sauven, executive director of Greenpeace, and John Hilary, executive director of War On Want. Oh, and there was poetry from me. 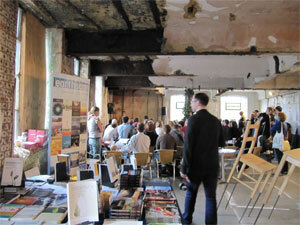 The event was held in a disused industrial building, Bargehouse, at Oxo Tower Wharf on the Southbank in London, and people queued round the block to get in. The Festival of Interdependence was an extraordinary mixture of talks, workshops, installations and films, and I was very pleased that people came up to me after my shows and said they found my poems ‘inspiring’. Thank you to Corrina Cordon and Elli Moody of nef for their organisational work, and to all the nef volunteers and staff who were so helpful on the day.